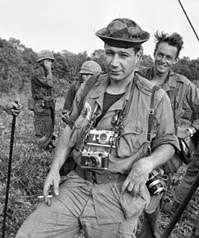 With one of the largest number of collections from contemporary photojournalists, the Briscoe Center’s photojournalism holdings sit at the intersection of two of the Center’s most important — and rapidly growing — collection strengths: thenews media archives and photographic materials. Situated in the context of the Center's other archival holdings (including the personal papers of media industry pioneers, research archives, and newspapers), the Briscoe Center provides researchers with unparalleled resources on of the history of photojournalism. Photo captions and cutlines are the most read body type in a publication. Of all the news content, only the titles of stories or headlines have higher readership than captions. Standards of accuracy, clarity, completeness and good writing are as high for captions and cutlines as for other type. Cutlines. They lead an unglamorous existence in the lives of many journalists. An afterthought. We type them after we've written our stories. We often forget to write them. This explains why many a newsroom features Editor A yelling to Reporter B, "Hey, where's your cutline!" Photo captions are an integral part of newspaper storytelling, but they are often the most underdeveloped element in the mix of words, graphics, and photographs in a newspaper. More help online . . .